Top-selling A&M artists, Carpenters, released thirteen studio albums and many compilations over the years. These compilations often contained different mixes from the standard versions placed on the original albums through Richard Carpenter’s desire to provide the best possible sound for the listener. Early on in their career, Richard was limited to the somewhat primitive equipment of the day, resulting in recordings that had limited capacity for their need to use large numbers of channels. Through latter-day, meticulous remixing and re-recording, Richard has supplied many updated tracks for quite a few of those early songs, particularly the hits. These usually involved re-recording his own piano parts in stereo, adding reverb to Karen’s vocals, and enhancing the bass and drums. Fans are split on the subject, some being very enthusiastic about the remixes, others finding that they prefer the original mixes that they grew up with. Adding to the complexity is that some tracks got more than one remix over the years, lending confusion as to which mix appears on which compilation. This site has endeavored to clarify the situation with hours and hours of actual, detailed listening sessions of every compilation available, comparing recordings with one another. Some of these compilations are obscure, others are common – and as any more become available, they’ll be added here for reference. The subject of the recording of “B’wana She No Home” has received a lot of discussion lately on the forum. Is it mono? Is it stereo? If stereo, why so narrow? Why so muddy? Which also brought up the topic of the vinyl versions on the single and the PASSAGE album. Some fascinating theories, audio examples, and discussions on this one track can be found in our Forum. Join in with your views. A recent discussion of the forum of the 2-LP compilation YESTERDAY ONCE MORE issued as a TV direct response advertisement has led to its inclusion in the Resource. Normally, early compilations in other territories have been omitted as they pretty much always contain the standard album or single mixes up to the time that they were issued. But this YESTERDAY ONCE MORE compilation in 1984 kind of started the ball rolling for Carpenters compilations and set the stage for the 1985 compilation that began the remix bandwagon. As such, we felt it was a natural for inclusion here. Join us in our discussion or examine the compilation in our Resource. A&M Corner member NowhereMan has pointed that way to a Japanese documentary about Carpenters and their song “I Need To Be In Love” featuring Richard Carpenter, John Bettis, and others associated with the group and the song and how it became a huge hit in Japan. Visit our discussion forum and check out the video and our chat about it. MY MUSIC PRESENTS has once again given Carpenters fans quite a treat for the Christmas season. An additional half-hour program has been added to the prior CLOSE TO YOU: REMEMBERING THE CARPENTERS focusing on the duo’s Christmas recordings and TV specials. As a premium to raise funds for Public TV, another DVD is being offered this year. 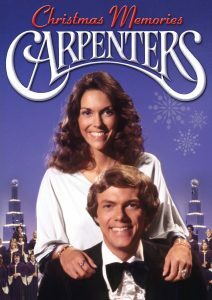 Titled CARPENTERS CHRISTMAS MEMORIES and longer than the TV program, it’s sure to be an annual favorite by fans who have been clamoring for Christmas videos for a long time. So keep an eye out for your local Public Broadcasting TV station’s schedule this holiday season. On October 8th, 2016, the solo KAREN CARPENTER album turned 20 years old from its release in 1996. Join in the discussion at A&M Corner about the release of this important album 20 years ago. A tie-in compilation to compliment the UK ITV program of the same name, THE NATION’S FAVOURITE CARPENTERS SONGS is now a reality and updated here in these pages. The track listing is a chronological ordering of the twenty songs included. Join in on our discussion on the Forum.